Just what is your exit strategy now? Coal hasn’t really worried about the future since he died. Coal now you ruined Lokki and Hedda shopping time. sigh. Loki’s shopping time I grant you. But Hedda’s? Meet Ibrahim the Moor ? Not the best first meeting, by the way. Though not worse than the whole “sword through the chest” thing with Loki. I guess. True! A sword through Ibrahim’s chest would be monumentally worse. Definitely enjoying this arc, and I'm greatly looking forward to seeing what you do with it. Love the design of the chainmail and all the other little things that you put into your art. Well, Ibrahim, what are you going to do to that thief, hmmm? This is not an auspicious way to meet someone! Definitely not! Ibrahim certainly hasn’t had to deal with thieving Northmen either. Coal. Coal, that’s rude. Quit it. Where are your manners? Welp indeed. Coal, I know you’re on a mission from the gods, but don’t you think you could be a little bit more subtle? Oh who am I kidding. This is Coal we’re talking about here. Uh, no offense. Coal is as subtle as a bear. hey, a new reader here, I just adore your comic, the style is unique and your interpretation of the norse gods and mythology is very spot on! anyway, I love this comic, definitely putting a tag. please keep up the good work! Thank you so much! Sorry about the text on top! >_>; I have a font that kind of switches letters around based on if Caps is locked or not, but I didn’t realize they might mess some people up. This will be a reminder to me not to use this anywhere in the comic. XD I’m glad you’re enjoying the comic so far! 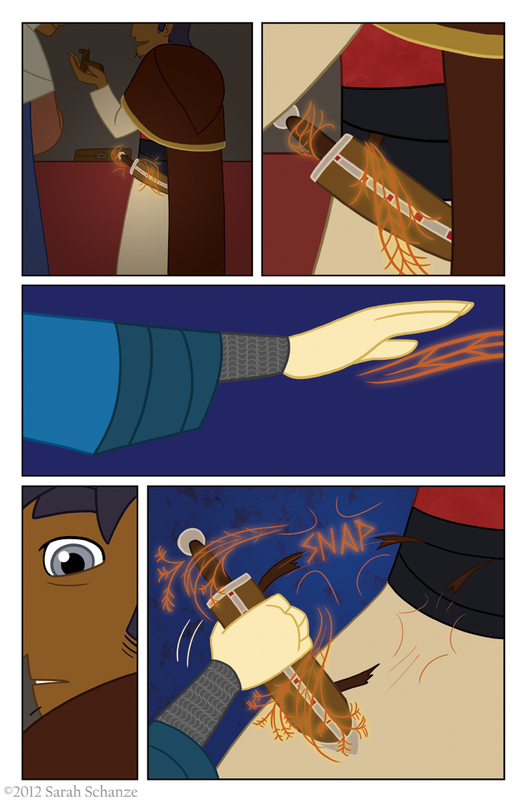 I suspect Coal’s immunity to things like being run through with a sword is going to become important very soon. Well it would definitely help in a fight! Ooooo, the magic summoning Coal looks like wheat. Annnnd he’s just swiped a dagger. I’m going to bet this is the piece of Frejr’s sword then. And daaaaang, Coal IS strong. I keep forgetting that. But he just snapped a leather belt like it was nothing. It’d be even scarier if he managed to snap silk by tugging. Heracles eat your heart out. Freyr is married, yes! The piece of his sword was taken long before he met her though. Loki’s sneaky like that. And you’ve yet to see Coal’s strength. Mwahahaha. That chain mail is pretty tight. He’s gonna have a pattern on his skin.